Virginia Tech baseball is less than a week away from opening day. The Hokies begin their season on Friday by traveling to DeLand, Florida where they will face Stetson University. They’ll stay in the Sunshine State and face Manhattan on Saturday, and Sam Houston State on Sunday to complete the mini-tournament. Results aside, more than anything coach John Szefc wants to see his team in action to get his first glance at how all the preseason preparation has paid off. The first weekend will be used to establish and cement a lot of different roles for the team, such as who will fill the void as weekend starting pitchers, who will be the first guy to go to in from the bullpen, how the lineup going to be completed from top to bottom, etc. Szefc and the coaching staff have spent long hours thinking through the different scenarios, so now it’s time to put it into action. Up and down the roster there are plenty of new faces for Virginia Tech. The Hokies’ current roster is filled with 21 newcomers of the 36 players on the team. It’s an odd makeup for a college baseball team, and one that could potentially offer some concerns looking into how a completely new group gels together, but as Szefc mentioned, there have been three to four months of work to iron out those details. Still, the key word that’s been offered up at this time is patience. It’s all put a little more emphasis on the returning players leading the way in a sense. The five seniors – Luke Horanski, Luke Scherzer, Nick Owens, Jack Owens, and Nick Menken – have been charged with setting the example for the younger players. “All good programs have some good older guys that can [provide leadership],” Szefc said. “I’d say that we’re probably leaning on that maybe a little bit more than usual just because we have a lot of new guys. The area where the Hokies feel the best right now is in terms of their depth. Of the 21 newcomers, nine are pitchers who should provide Szefc and Co. with plenty of options to turn to during the season. 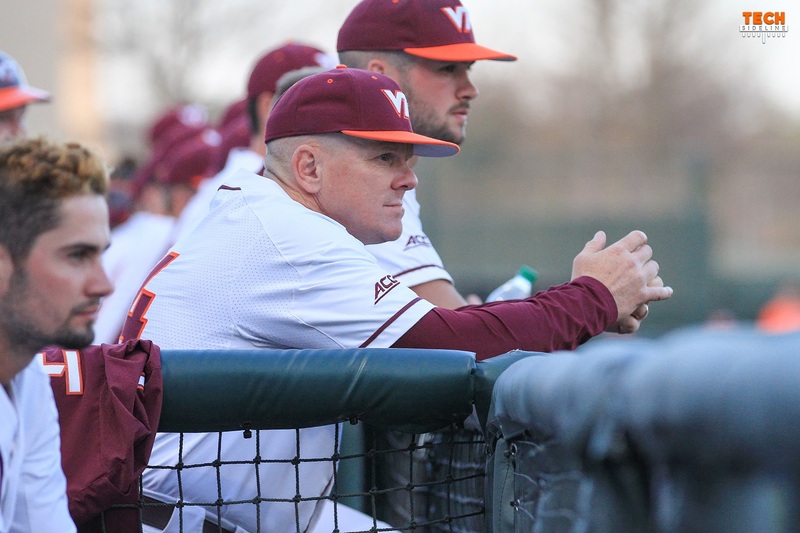 One player who’s been around the block for Virginia Tech, but hasn’t really gotten his chance to shine, is redshirt sophomore pitcher Connor Yoder. The 6-foot-7, 250-pound hurler missed 2017 with Tommy John surgery and spent much of 2018 sidelined with injuries. The Hokies are optimistic that this is the year that the power arm could finally break out. Soon enough Virginia Tech will be lacing up the cleats, flashing the leather, and donning the maroon and orange for live game action. It’s the beginning of the year, when every team in the country is just ready to play ball. “Every coach is going to optimistic this time of the year unless you have major injuries or major subtractions by academics or something like that,” Szefc said. “We were lucky enough not to have any of that stuff. I didn’t make it to a game last season. Looking forward to seeing the renovated stadium and facilities from the inside. Hope the Hokies continue to improve and the players stay healthy. I appreciate you covering baseball. Really hoping our program can get it going. Can Yodor play power forward?